Rant, grunt & ooooohhhh yess! Partial unofficial tally for Naga City as of May 15, 2013 compiled from the COMELEC/SMARTMATIC website and other data from field (the reason why it does not match with COMELEC). There are 8 remaining barangays to tally (cluster number in bracket) with no data yet, these are Balatas (26), Calauag (28, 29 and 31), Cararayan (33 and 34), Carolina (40), Del Rosario (51), Mabolo (61), Sta Cruz (89 and 91) and San Felipe (81). Remaining clusters has a total of 9,886 registered voters. 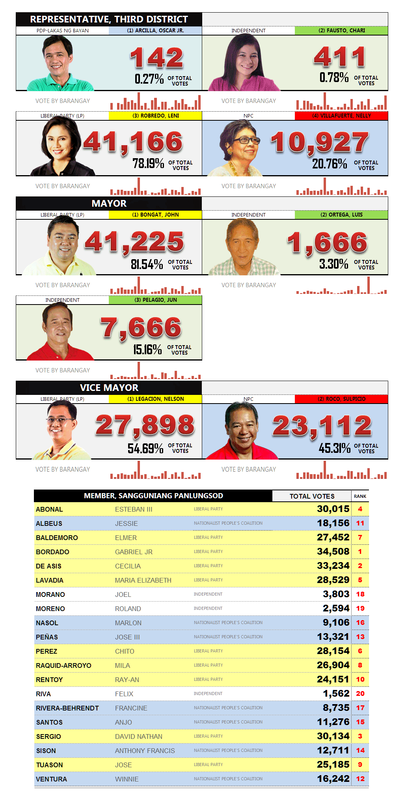 BIGBOARD Results by Barangay — click above image to zoom actual size (3838pxx1238px). Some figure incomplete i.e. actual voters per cluster yet to be incorporated. The people of Camarines Sur – District 3 has finally decided! Atty. Leni Robredo’s 76.75% winning percentage was crystal clear. The Villafuertes’ 21.51% share is indicative of D3 thirst for a new brand of politics. Goodbye trapos! No more to mansanas! Let’s move on for a better D3.